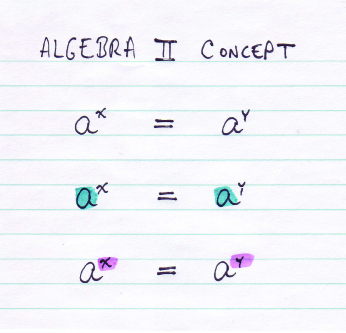 Lately I’ve been having great success using COLOR to explain algebraic concepts, as strange as that may seem. I’ve found that is that adding color to equations helps students see important relationships among the terms, for it lets them visually group related terms. This is impossible to explain without an example, right? So here’s one to show you how it’s done. 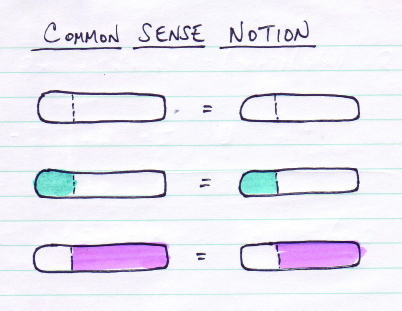 GIVEN: Two terms are equal to each other, and each term has two parts. CONCLUSION: IF two of the parts are equal (blue), you can CONCLUDE that the other parts are also equal (pink). The conclusion, of course, is that x + 4 = 9, meaning that x = 5. Notice that I consistently use the same colors to indicate the same ideas: blue, to show the parts that we know are equal; pink, to indicate the parts that we conclude are equal. The conclusion, of course, is that THEREFORE x = y.
I get a lot of quiet “Now I Get Its” when I show this to Algebra II students. The “Aha” looks that I get remind me that while this concept is obvious to me and you, many students don’t grasp it fully. 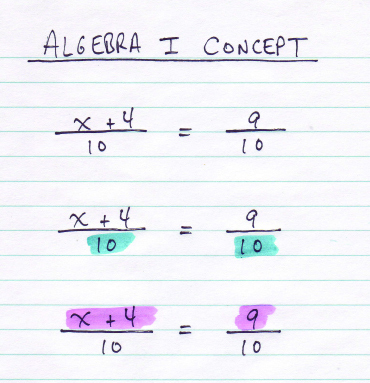 In any case, I wanted to share this because I’ve found that there’s great potential in using color to explain aspects of algebra. I hope that you find this useful, and I encourage you to use color yourself. 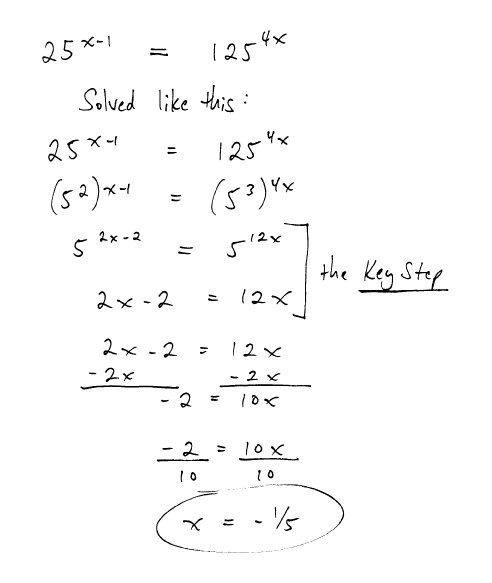 The key step is only valid if the function x := a^x is one-to-one, which will not be the case. e.g., for a = 1.